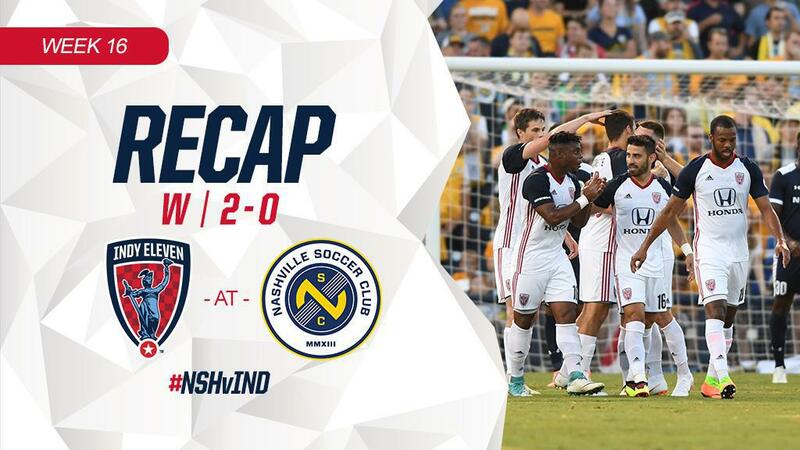 Indy Eleven silenced Music City side Nashville SC, 2-0. The “Boys in Blue” are now three for three in the last trio of away fixtures. Tonight's win also marks the first time Nashville has fallen at home and the first time the Tennessean side has trailed on home turf. Despite an early offensive showing from Nashville, Indy Eleven found the opening goal of the night in the 15th minute. Nashville goalkeeper Matt Pickens deflected a shot on goal out of play near the 14th minute. Eleven defender Ayoze stepped up to corner and placed a square pass to the far edge of the 6-yard box where defender Karl Ouimette headed the ball into the upper left corner of the goal. Ayoze adds another tally to his dead ball influence on the scoreline and Ouimette nets his first as member of “Indiana's Team”. Indy doubled its lead 20 minutes later thanks to striker Justin Braun. Indy won the ball in their defensive half and pushed their attack along the left wing. After inching towards the 18-yard box, Braun took a shot at angle. The ball took a small skip and slipped under Pickens as he dove for the save. The ball bounced off the far post and past the line to widen the score gap. Nashville fed several shots towards the goal throughout the match, only to end over the crossbar or into the arms of Indy goalkeeper Owain Fon Williams. Nashville's best opportunity came in the 66th minute. Nashville midfielder Bolu Akinyode comes extremely close to converting off a volley from a corner kick, with the ball out of Fon Williams' diving reach. Luckily, Ayoze found his way to the ball's destination and headed the attempt clear of the frame. Though things got chippy in the final minutes of the fixture, Indy Eleven collected another three points on the road before the club's next match against Penn FC four days from now. The “Boys in Blue” return home this Saturday, June 30 at 7:00 p.m., for Pride Night against Penn FC. Fans can get tickets to the next home match starting at just $15 by visiting IndyEleven.com/Tickets or by calling (317)685-1100. Tuesday, June 26, 2018 – 8:30 p.m.